We believe in the development of both the student's mind and the artist's creativity. Therefore, we are dedicated to providing a broad and deep understanding of the making of theatre in all its aspects. In addtion, we offer courss designed to introduce all students to theatre and theatre studies as part of a larger liberal arts curriculum. The Marriage of Figaro by Beaumarchais, translation by William Gaskilll. Performed in February and March, 2002. This play was directed by Dr. James F. Schlatter and staged in the Studio (now Montgomery) Theater, Annenberg Center. The play was selected as a Senior Thesis Project in Acting for four Theatre Arts Program students: Denise Fiore (above, left), Megan Gaffney (above,center), Brett Greenberg and Gabriella Ianoale (above, right). Rebecca Hatkoff was the Assistant Director/Stage Manager, Peter Whinnery designed the lighting with assistance from Gregory Cooper, Assistant Lighting Designer. The Theatre Arts Program at Penn offers students the opportunity to study theatre in the classroom and in production work under the guidance of faculty members who are experienced and trained actors, directors, scholars, and teachers. Structured as a comprehensive liberal arts curriculum, the program offers a full range of courses in all areas of theatre study, among them: acting, directing, design, theatre history, dramatic literature, performance theory, playwriting, dramaturgy, musical theatre, as well as many other specialized topics. 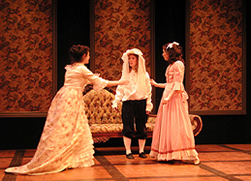 Students may also receive course credit for working on faculty-directed productions. Guest artist-teachers provide the opportunity for additional training in such areas as voice, movement, solo performance, physical theatre, etc. Penn takes advantage of its location—Philadelphia has a vibrant and active theatre community and we incorporate local productions in our classes and extra-curricular activities as often as possible. Students may also earn credit for course work conducted off-campus through such programs as Study Abroad and Penn Summer-in-London. Theatre Arts welcomes all Penn undergraduates to enroll in classes and participate in productions. Some students choose to take a class or two in theatre as part of their liberal arts education; others choose to major in theatre, making it the primary focus of their academic careers. Penn makes it possible for students to “double major,” and many Theatre Arts majors have a second area of focus in another department or school at Penn. Theatre Arts also offers a theatre minor. Eligible senior majors are invited to undertake an Honors Thesis Project, which is based in practical performance or scholarly research. Each year Theatre Arts mounts a production season, with plays directed by members of the faculty and by advanced majors, and all Penn students are welcome to audition. For nearly thirty years, the program has staged plays and performance pieces from many different places, periods, and genres. We offer workshops, staged readings and co-sponsor a playwriting competition with the Kelly Writers House. The educational philosophy of the Theatre Arts Program is that academic and artistic courses go hand in hand and that serious study in the classroom and applied work in the rehearsal room are both integral aspects of learning the rigorous and rewarding art of theatre-making.